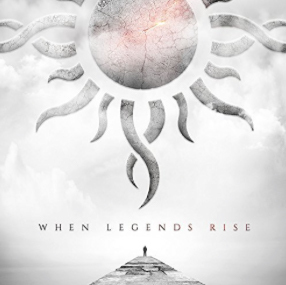 Godsmack released their 7th studio album When Legends Rise and first in four years. Produced by frontman Sully Erna and Erick Ron, it is Godsmack taking to the next level. The songs are performed with the vitality of a band that keeps surprising us in burst of passionate intensity. They successfully reinvented their identity and changed it up a little without losing the heavy metal core of what made them appealing to begin with. The sound is bigger and more in line with what they are and where they are right now in their lives. Blending vulnerable, authentic lyrics and infinitely relatable with a strong textured music, it is a shot of adrenaline with unforgettable melodies and sing-along choruses that will put them at the top of your favorite playlist. They weave vocals nicely with layered textures, intricate harmonies and inspired rhythm section combined with contemporary vibe. They reach exciting new creativities on the album with a music, simultaneously very hooky and heavy, defying your expectations, never disappointing from beginning to the end. They groove hard. The melodies are more modern than previously. The strong opener When Legends Rise and Bulletproof set the tone on radio, but some songs like Every Part of Me, Take it To the Edge and their first ever ballad Under Your Scars could do damage at radio too. Under Your Scars is pure beauty. The song reaches new dimensions with this blend of strings and piano. It also have great guitar riffs. Unforgettable has a kid’s choir. Someday is vigorous. Just One Time is a huge powerful blast of heavy rock sounds. Say My Name is an electrifying pure rock anthem while Let It Out shows their ability to create their own twist with heavy sounds. The closer track Eye of the Storm is a mature beast of rock. All in all, Godsmack ’s new album When legends Rise, is the kind of album that you can’t stop playing. The record impresses with its creativity and great musicianship for our pleasure. It is a fascinating insight into their musical history. Arguably one of best albums for 2018, When Legends Rise is somehow contemporary and timeless at the same time. Grab your copy now here.